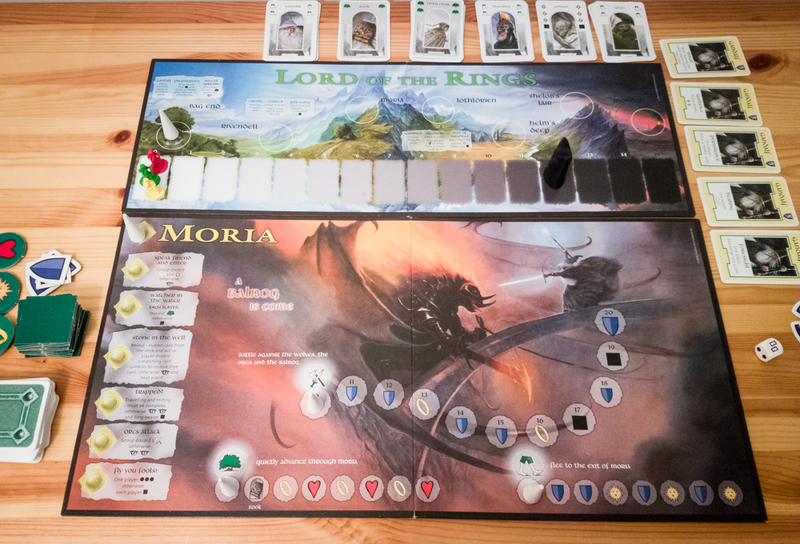 This Lord of the Rings board game review was made after playing the game 20+ times. Lord of the Rings is a cooperative adventure game from Reiner Knizia based on the very popular fantasy novel from J.R.R. Tolkien. Your goal is to make it to Mordor and destroy the ‘One Ring’ before the evil Sauron is able to gain control of it. 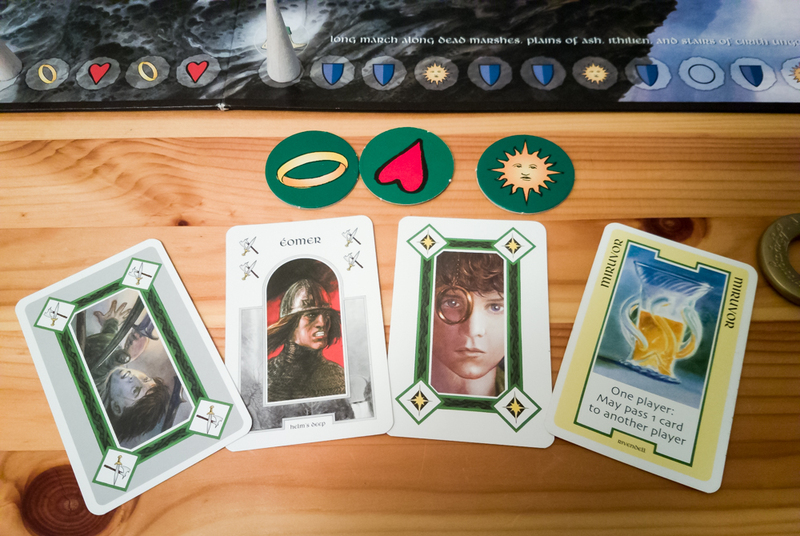 The key to understanding how to play Lord of the Rings is knowing how the boards work. The Master board is where the hobbits and Sauron are placed, and it’s also where you’ll find directions for playing through the different locations. You’ll track your progress at the top of the Master board and you’ll see how close Sauron is to corrupting the hobbits on the track at the bottom of the board. Below the Master board is where you’ll place the Scenario boards. These boards have a number of negative events that you’ll go through when you draw certain event tiles. They also have activity lines that track your progress during the current scenario. Once you reach the last spot on the main activity line (the one with the scoring numbers), you’ll move on to the next Scenario board. Turns are really simple in this game. You’ll start out by flipping an event tile. If that tile is a negative effect, you’ll resolve that effect and flip another event tile. If the tile shows an activity symbol, you’ll resolve that tile and then move on to playing cards, drawing cards, or moving away from Sauron on the Master board. After you’ve performed one of the three actions, the next player takes their turn. There are four activity symbols in the game: Friendship, Traveling, Hiding, and Fighting. If you draw an activity symbol on an event tile, you’ll move the marker forward one space on that activity line and resolve the effect shown on the new space. If you choose to play cards, you’ll simply move the markers on the activity lines shown on your cards and resolve all of the spaces that you moved through. The cards with activity symbols on them are either white or grey. You can play one or two cards on your turn, but to play two of them one has to be white and the other grey. There are also some special Feature cards that you’ll get during your travels that can be played at any time during the game (even on other players’ turns). Some of the spaces on the activity lines will give you shields. If a player has five shields, they can spend them at any time to call on Gandalf and use one of his special abilities. There are also three different types of life tokens that you can gain on the activity lines; any that are missing at the end of a scenario will force the players to move closer to Sauron on the corruption track. Whenever the die symbol shows up in the game, you’ll have to roll and resolve the die. There is one “good” side of the die where nothing happens, but the others are all negative effects. One side of the die has Sauron move closer to the hobbits, three sides move the current player’s hobbit closer to Sauron, and one side has the current player discard two cards. The hobbit who has the ring, the ring-bearer, is the one that you’ll want to protect from Sauron at all costs. The ring-bearer can use a special ability once per scenario that allows you to skip forward 1-4 spaces on one of the activity lines after rolling the die. 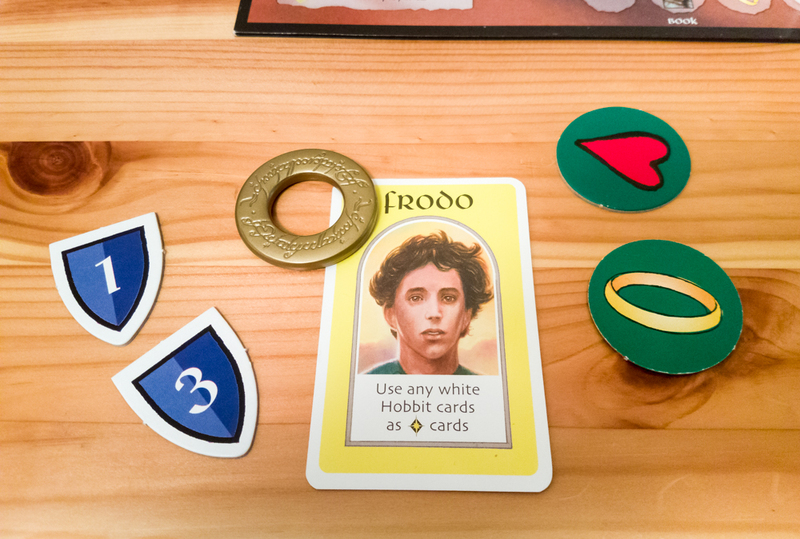 Frodo always starts the game as the ring-bearer, but it can change at the end of a scenario based on who has the most Ring life tokens. There is player elimination in Lord of the Rings. If any hobbit ends up on the same space as Sauron on the Corruption track, they are out of the game. You’ll lose the game if the ring-bearer is ever on the same space as Sauron. You’ll win if you successfully make it to Mordor and destroy the ring, which is done by making it to the final space and avoiding being caught by Sauron after a single roll of the die. If you want to keep track of how well you’ve done, the rulebook includes a scoring system that you can use. I really like this type of cooperation in games where most of the cooperation is in player communication. You really do have to talk about how to approach each turn to give yourself a real shot at winning the game. If you just throw down random cards each turn, chances are you’re going to lose. The game is on the lighter side, but there are plenty of tough decisions that you’ll have to make. You have to be patient with your Feature cards since you only get to use them once and, similarly, you have to spend your shields wisely to get the most out of Gandalf’s abilities. I know most co-op designers these days avoid player elimination, but it makes thematic sense in this game. The hobbits want to protect that ring, so sacrificing one to protect the ring-bearer is sometimes the only way you can pull off the win. Plus, in most cases players get eliminated near the end of the game, so it’s really not that big of a deal. John Howe’s artwork on the boards and cards is great. It is very easy to tweak the difficulty level. You simply start Sauron further up the Corruption track at the beginning of the game and you’re good to go. You can get really unlucky with the event tiles. Remember that you keep drawing after getting any type of negative tile, so you could end up pretty far in the hole before you’re even able to take an action. This rarely happens, but it has ruined a couple of games I’ve played over the years. Some people will not like that the game almost completely focuses on the hobbits. The other main characters come in the form of Feature cards, so they’re really only there to perform one action and then they’re gone. Oh man, those cone trackers found in the first couple of editions of this game are uggggly. I actually prefer the overall look of the early editions over the latest one from Fantasy Flight, but those cones were a bad idea. This Lord of the Rings board game really is a classic. Sure, Pandemic started the latest co-op craze, but Lord of the Rings was probably the first big cooperative game to hit the market and it inspired others to design co-ops. It’s not as attractive as some of the games that have come out over the last decade or so, but it has smoother gameplay than most and it is a consistently fun challenge. 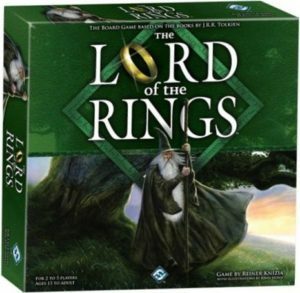 I’d recommend The Lord of the Rings: The Card Game to people looking for a two-player co-op since it is more thematic and a better overall experience, but anyone that is into Lord of the Rings and wants to play with more players should check this one out. It’s a bit harder to find these days, but there are definitely some copies floating around out there. Thanks for taking the time to read our Lord of the Rings board game review! To stay updated on all things cooperative board games, follow us on Twitter, Facebook, or via RSS.